The Missouri Southern Athletics Department has announced its 2016 MSSU Athletics Hall of Fame Class that will be enshrined as part of Hall of Fame Weekend on Saturday, Sept. 24, as the Lions play host to defending National Champion Northwest Missouri State at Fred G. Hughes Stadium. 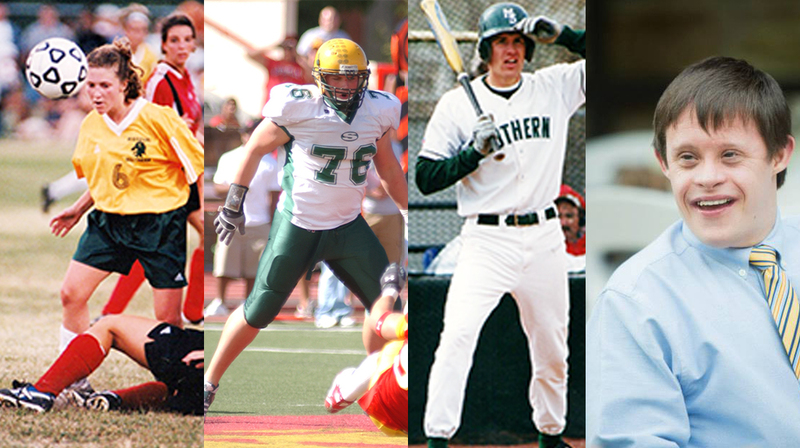 Amanda Zook (Women’s Soccer – 1999-2002), Allen Barbre (Football 2003-06), Matt Meyr (Baseball 2000-2001) and Rob Corn (Meritorious) will all be enshrined into the 2016 class of the Hall of Fame. The newest class will be present at a social that Friday evening and will be inducted at a lunch on Saturday. The group will be introduced as new Hall of Fame members at halftime of the Lions’ football game vs. Northwest Missouri that Saturday. Below are short biographies of each of the newest inductees. Amanda Zook (Women’s Soccer – 1999-2002) – Zook becomes the first MSSU women’s soccer player to be inducted into the Hall of Fame and it is fitting that she was part of the start of the program’s history. Zook was a member of the inaugural Lions women’s soccer team that debuted in 1999. A native of Lee’s Summit, Mo., Zook played in all 72 games in the Lions’ first four years as an intercollegiate program. A defender, Zook was a four-time All-MIAA performer. She scored one goal and had five assists as a defender in her career and helped cut the goals against in half from year one to two. The team allowed just 31 goals in each of her final two seasons holding opponents to a 1.47 goals against average in 2001 and 1.37 in 2002. The team went 10-8 in 2001 and 11-5-2 in 2002. Zook was a team captain for two seasons and won the Lionbacker Award of Excellence. She graduated in 2002 from Missouri Southern with a degree in business administration management and went on to earn a master’s degree in human resource management from Webster University. She resides in the Kansas City area and is currently employed by UnitedLex as a Human Resources Manager. She holds senior-level professional certifications in the fields of Human Resources and Payroll. Barbre was a consensus All-American, All-MIAA and All-Region first-team selection in 2006. He helped lead an offensive line that saw quarterback Adam Hinspeter become just the second passer in school history to throw for 2,000 yards twice in a career. The offense amassed 3,461 yards for the season, including 2,527 passing. He finished with a career-high 94 knockdowns at left tackle and also excelled on the punt coverage unit, coming up with seven solo tackles. Barbre was Southern’s first All-American since Josh Chapman in 2002, and was the first to be named first-team since Richard Jordan in 1996. He was the fifth offensive lineman at Southern to be named first-team All-American joining the likes of Terron Jackson (1972), Willie Williams (1976), Joel Tupper (1982) and Yancy McNight (1995). He was the ninth Lion at the time to be named first-team All-American. For his career, Barbre started 33 of 37 contests. All but one of those starting assignments came at the demanding left tackle position. He was credited with 254 knockdown blocks and registered ten tackles (nine solos) on special teams. He was the first player at the time from Southern to be invited to the NFL Combine. Barbre also has a rushing touchdown to his credit as he was part of a memorable formation that saw the Lions line up with 11 offensive linemen in a goal line formation as Barbre ran in the ball for a touchdown just days after then Lions head coach John Ware tragically died during Homecoming week. The formation and play was done in honor of Ware who was a former offensive lineman and helped coach the group. Barbre was drafted in the fourth round of the 2007 NFL Draft by the Green Bay Packers. He played for the Pack from 2007-2010. He played for the Seattle Seahawks and the Miami Dolphins during the 2010 season and then was back with Seattle for the 2011-2013 seasons. He has since been playing for the Philadelphia Eagles where he is a starter at left guard. Barbre is a native of Granby, Mo., where he prepped at East Newton High School. He graduated from Missouri Southern in 2015 with a degree in criminal justice. He and has a wife, Callie have two sons, Knox and Beau. Meyr was a two-year player for the Lions roaming the outfield after transferring to Southern from Forrest Park Community College in St. Louis. Meyr was the 2001 Ken B. Jones award winner which is given annually to the top student-athlete in all of the MIAA. That season, Meyr was second in the MIAA in batting average (.457) and that mark still stands as the third-best ever single-season mark in MSSU history. That year, Meyr led the team in average (.457), runs (71), hits (85), doubles (22), home runs (7), RBIs (73), slugging (.720) and on base percentage (.720). Meyr finished the year by earning MIAA Player of the Year honors, as well as being named first-team All-MIAA. He was a first-team All-Region honoree, while earning third-team All-American honors that season. His honors didn’t stop on the field, however, as Meyr was a first-team Academic All-District honoree that year carrying a 3.71 GPA as a math education major. He was also a member of the MSSU Dean’s List and the MIAA Academic Honor Roll. A native of Perryville, Mo., Meyr graduated from Missouri Southern in 2002 with a degree in math education and is currently a high school math teacher at Galena High School where he is the head basketball coach and assistant baseball coach. He has a wife, Breanna and the couple has five children, Lane, Rylie, Emma, Jaci and Colton. Rob Corn, the son of former Lions’ coach Robert Corn, has roamed the sidelines at the Leggett & Platt Athletic Center since the memorable 1999-2000 season, first with his father at the helm, and now with current head coach Jeff Boschee. Rob has been a vital part of Lions basketball for 17 years now. When you think of MSSU Basketball, you think of Rob Corn. He is a part of the game day rituals for the team and is always the first to congratulate a player when they make a great play and the first to offer a hand on the shoulder when they’re down. Rob has been vital in keeping a positive attitude for the players in the locker room and his post-game speeches have been epic and will always ignite the team, allowing them to enjoy the moment together. His pride for Missouri Southern is second-to-none and his loyalty to the program is just as strong. Rob would do anything for the program, just don’t ask for some of his halftime nachos. Rob joins his father, Robert, who was inducted into the Hall of Fame in 2000. Rob is the son of Robert and Cindy Corn and resides in Joplin with his parents. With the addition of the 2016 class, the MSSU Athletics Hall of Fame now includes 117 members and two teams.